Governor Andrew M. Cuomo today unveiled the eighth signature proposal of his 2016 agenda: modernize and fundamentally transform the Metropolitan Transportation Authority, dramatically improving the travel experience for millions of New Yorkers and visitors to the metropolitan region. The Governor’s proposal includes a new approach to rapidly redesign and renew 30 existing subway stations across the system. It also includes a number of technology initiatives to bring the system into the 21st century, including expanding Wi-Fi hotspots, accelerating mobile payments and ticketing to replace the MetroCard, and providing USB ports on subway trains, buses and in stations to allow customers to charge their mobile devices. The Governor detailed this proposal at an event earlier today at the New York Transit Museum in Brooklyn, where he was joined by MTA Chairman and CEO Tom Prendergast. "Once again Gov. Cuomo is stepping up on behalf of transit riders and transit workers," Transport Workers Union Local 100 President John Samuelsen said. "These projects will greatly improve the commutes for scores of riders and we're proud to be doing our part." More than six million people ride the New York City subway on its busiest days, and the Governor’s proposal is designed to bring rapid improvements to their daily experience while enhancing a system that is more than a century old. The Governor’s proposal introduces new customer-friendly initiatives and accelerates existing projects to bring meaningful improvements to the transit system that New York relies on. The MTA will revamp the design guidelines for subway stations to improve their look and feel, then put them in place at 30 stations across the entire system which will be completely renewed. These cleaner, brighter stations will be easier to navigate, with better and more intuitive wayfinding, as well as a modernized look and feel. A list of those 30 stations is available here. The MTA will use design-build procurement to deliver the projects more quickly, at a lower cost and with better quality, as a single contractor will be held accountable for cost, schedule and performance. Stations will be closed to give contractors unfettered access with a singular focus – get in, get done and get out. Similar improvements will come to the Richmond Valley station on the Staten Island Railway, and the entirely new Arthur Kill station opening later this year will also feature many of these elements. These new processes and innovations will inform future improvements to stations on the Long Island Rail Road and Metro-North Railroad as well. Work on the majority of these 30 stations will be completed by 2018, and all will be finished by 2020, with timeframe for redevelopments from start to finish being reduced by more than 50 percent. On average, station redevelopments are expected to take between six and 12 months. Comparatively, under the previous piecemeal approach, station redevelopments relying on night and weekend closures could take two to three years or more to be completed. The Governor’s proposal also embraces innovation and accelerates the deployment of modern technology throughout the MTA system. Wi-Fi and cellphone service: More than 140 underground subway stations already have cellphone, data and Wi-Fi service, and the deployment of this enormously popular amenity will now be accelerated. All 277 underground subway stations will have Wi-Fi service by the end of 2016, and cellphone service will be available in all of them early in the following year. Mobile payment and ticketing methods: The Governor’s proposal also accelerates the process of bringing mobile payment methods to subways and buses, allowing riders to pay their fares by waving a cellphone, a bank card or another payment device over contactless readers. This will modernize the payment process, so customers can board buses and pass through turnstiles more quickly, as well as manage the value in their accounts online instead of on physical cards that can be lost or damaged. Subways and buses will start using contactless payment methods in 2018. The MTA will begin offering mobile ticketing on the Long Island Rail Road and Metro-North Railroad within six months and fully introduce it by the end of the year, giving railroad customers the same ability to buy tickets on their mobile devices. 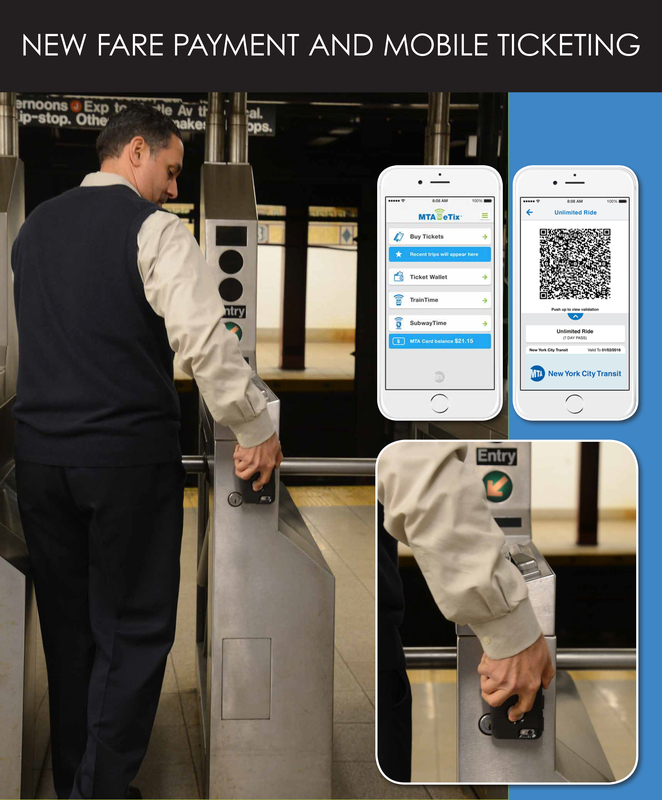 Railroad customers who also ride subways and buses will be able to pay their fares using a single app and a single transit account starting the following year. Countdown clocks and real-time data: Other technological improvements included in the Governor’s proposal will install more countdown clocks and deliver real-time arrival data on all subway lines. Countdown clocks have proven popular on the 1, 2, 3, 4, 5, 6 and L subway lines as well as the 42nd Street shuttle, and the MTA will begin installing them this year on the 7 line as well as the lettered subway lines. The MTA will also accelerate delivering real-time arrival data for all 469 subway stations, which will be available on the MTA’s SubwayTime app and will be streamed as an open data feed for any developer to use. Additional Technology Initiatives: The Governor’s proposal will also improve the customer experience aboard subway cars and buses with digital information screens, Wi-Fi hotspots and USB charging ports for mobile devices. 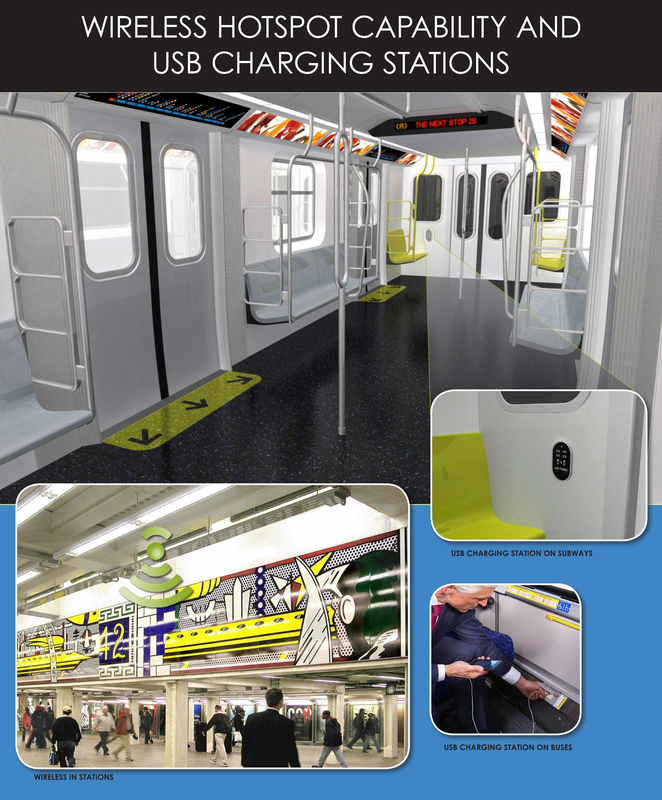 Charging ports will be installed on 200 subway cars this year and 400 next year, while all new buses delivered starting later this year will have Wi-Fi hotspots. By 2018, some 1,500 buses will have Wi-Fi hotspots and USB charging ports, bringing a new level of connectivity and convenience to customers. A pilot program to install digital information screens on 200 buses will also launch this year, displaying information about upcoming stops and service alerts. The MTA this year will more than double the number of On The Go Travel Stations, the interactive digital touchscreen kiosks that provide real-time service information, maps, travel planning and elevator and escalator status within subway stations. There are 169 On The Go Travel Stations in 31 subway stations today, and another 190 will be added in more than 20 additional stations by the end of 2016. The MTA is also deploying Help Points, instant communication devices which provide direct lines to emergency assistance as well as service information, and are topped with a distinctive blue beacon light. Help Points are already installed in 250 subway stations and will be added to at least 130 more stations this year, with all 469 stations featuring them by 2017. To ensure a safe environment for MTA customers, deter inappropriate behavior and help prosecute criminals, more surveillance cameras are coming to the MTA’s fleet. All new buses will be delivered with cameras installed, and existing buses will continue being retrofitted. By the end of this Capital Program, 85 percent of the bus fleet will have surveillance cameras installed. The MTA will also test installing surveillance cameras in subway cars for the first time later this year. The initiatives announced today build on the state’s significant efforts to transform the MTA and its infrastructure, such as the Governor’s recent proposals to transform Penn Station and the Farley Post Office building into one, interconnected world-class transportation hub, and to move forward with a long-overdue extension of the LIRR. Additionally, the state is contributing $8.3 billion to help fund the MTA’s $26.1 Capital Program, which when combined with existing efforts will add more than 3,100 buses and 1,400 subway cars to the system, add four new Metro-North stations in underserved areas of the Bronx, begin construction on extending the Second Avenue Subway to East Harlem, and continue building the East Side Access project so the LIRR will be able to bring travelers into Grand Central Terminal.